Next Gen Cyber Talent Development solutions includes career training program development and management, live in-person workshops, and a world-class online learning management system. By using proven educational concepts and sound instructional design principles, we create the highest quality training focused on developing practical skills that are directly transferrable to the jobs market. 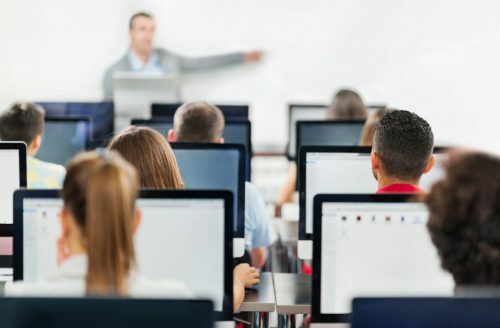 Our training courses and hands-on practice labs are continually updated to keep up with the rapidly evolving technology and security landscape. Next Gen Cyber delivers online IT and cybersecurity training through our Next Gen Cyber Academy. Our courses and practice labs help students and professionals around the world gain professional certifications from Microsoft, Oracle, VMware, Cisco, EC-Council, CompTIA, ISACA, (ISC)2, and more. With proprietary technology continuously being built, Next Gen Cyber Academy consistently develops new features and tools to deliver a learning experience to our students that is unmatched in the marketplace. Our career development team provides counseling and mentorship to all our learners. Our ultimate goal is to develop successful IT and cybersecurity professionals with the knowledge, skills and credentials needed to satisfy the needs of the job market. Our training team work in close synergy with our Talent Management teams to match those we train with job opportunities within our networks. We get you trained. We get you hired. Period. Our Live Hands-on Training Workshops will help you develop practical skills in systems engineering, database administration, computer networking, ethical hacking, computer forensics and more. This will be live instructor-led, hands-on training using our virtual lab platform. Students will get to work with real live equipment (*absolutely no simulations) in a safe environment without the cost of investing in hardware or software. Students can attend in-person or online. Check out a screenshot from our ethical hacking hands-on lab below. Next Gen Cyber Academy provides the next generation learning management system (LMS). An experience that combines the feature set of traditional Learning Management Systems with advanced functionality designed to make learning management easy and online learning engaging from the user’s perspective. Users can access our platform anywhere, on any device to learn, share, and grow in real time. Learn anytime, anywhere 24/7. All Next Gen Cyber Academy Courses replicate a live class experience with an instructor on screen delivering the course’s theories and concepts. These lectures are pre-recorded and available to the user 24/7. They can be repeated, rewound, fast forwarded and are fully controlled by the user. All Next Gen Cyber Academy instructors have a minimum of 10 years’ experience in the subject matter they are teaching and many times are the authors of the official content from the vendor. These instructors are energetic and charismatic to ensure that the student is engaged throughout their course and enjoys the experience. Next Gen Cyber Academy recognizes that all students do not learn alike and different delivery mediums are needed in order to achieve success for a large student base. With that in mind, we delivery our content in a variety of different ways to ensure that students stay engaged and productive throughout their courses. Our courseware includes instructor-led lab demonstrations and visual presentations that allow students to develop their skills based on real world scenarios explained by the instructor. Next Gen Cyber Academy’s custom practice exams prepare you for your exams differently and more effectively than the traditional exam preps on the market. Students will have practice quizzes after each module to ensure you are confident on the topic you have completed before proceeding. This allows students to gauge your effectiveness before moving to the next module in your course. Whether it’s Cisco, Microsoft or VMware, our Practice Labs unifies access to all of these vendors through a web browser interface. Pre-configured hardware layouts with accompanying lab guides for fast, convenient access to gain hands on experience. With step-by-step instructions covering thousands of practical tasks across Cisco, Microsoft, VMware and CompTIA exam titles, Practice Labs makes studying for an exam or learning new technologies an engaging experience.